Nozell, rhymes with Oh Hell: Rudy's campaign runs out of gas in New Hampshire! Let's hope Rudy himself runs out of gas too. A 60s/70s Cadillac land yacht. How Republican of them. And symbolic of the Republican mindset. Probably has baby sealskin seat covers. That isn't a NH plate on the front either, where the hell did they come from? They also don't look like the type of people Rudy has a mind to care too much about. Seeing working class people supporting Republicans is about as close as we'll know to witnessing starving Parisians peasants throwing flowers to in the path of Louis XVI. That is a old NH license plate. 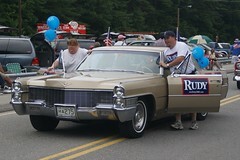 The Rudy supporters had two 1960s cars and a late model 4x4 -- see the photo below. Someone mentioned that those cars were also in the Amherst parade earlier in the day. As with all the other candidates, the parade walkers are mostly campaign staffers (typically people in their 20s) with some local people (people over 30, kids) We were asked to walk in the Amherst parade as well as our own Merrimack one. So Rudy's solution to America's dependence on foreign oil is to have two big fat (but domestic!) guys push every car? Sounds like a great plan, but what happens if we run out of fat guys?